No one can provide perspective on conflict resolution like experts who have been involved in some of the world’s most complex negotiations. Since 2001, the Program on Negotiation (PON) has bestowed the Great Negotiator Award upon distinguished leaders whose lifelong accomplishments in the fields of negotiation and dispute resolution have had compelling and lasting results. The Great Negotiator Case Study Package is available through the Teaching Negotiation Resource Center (TNRC). Each case study describes the featured negotiator’s background and examines the context, strategies, tactics, and outcome of a particularly difficult international negotiation in which the negotiator was involved. Used together, the case studies offer a unique opportunity to learn from recent history and to compare and contrast the approaches of four renowned professional negotiators. 2000 PON Great Negotiator: George Mitchell.“To Hell with the Future, Let’s Get on with the Past” features former U.S. Senator George Mitchell’s work on the all-party talks in Northern Ireland between 1996 and 1998 that culminated in the signing of the historic Good Friday Accords. 2001 PON Great Negotiator: Charlene Barshefsky. Featuring former U.S. Trade Representative Charlene Barshekfsky’s work from 1994 to 1996 negotiating a trade agreement with China. Includes both A Case and B Case. 2002 PON Great Negotiator: Lakhdar Brahimi. Negotiating a new government for Afghanistan, featuring former United Nations Special Envoy Lakhdar Brahimi’s involvement in negotiating an interim government for Afghanistan after the fall of the Taliban in 2001. 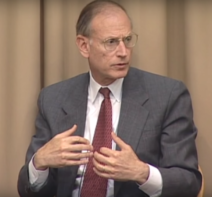 2003 PON Great Negotiator: Stuart Eizenstat. Negotiating the Final Accounts of World War II, featuring former EU Ambassador and Special Representative to the President, Stuart Eizenstat’s work facilitating the award of $8 billion in reparations from multiple European governments, banks, and companies to victims of World War II. 2010 PON Great Negotiator: Martti Ahtisaari. Featuring former Finnish President and longtime diplomat’s 2005 negotiation between the Free Aceh Movement (GAM) and the Indonesian government. The resolution ended 30 years of violence and became known as “The Helsinki Accords”. Includes both A Case and B Case. 2014 PON Great Negotiator: Tommy Koh. Details the efforts of Singapore Ambassador-At-Large Tommy Koh to negotiate the United States-Singapore Free Trade agreement. Highlights Koh’s successful actions to overcome the significant challenges presented by trade negotiations with the United States. Includes both A Case and B Case. These case studies are available as a collection with the Great Negotiator Case Study Package and also are available separately. These programs are only taught by our faculty. We do not publish papers at these sessions.